So it ends up that knitting with self-striping yarn is a lot of fun, and very addicting! I don’t know why it took me so long to give it a try! Pattern: socks over 68 stitches with an OMG heel. 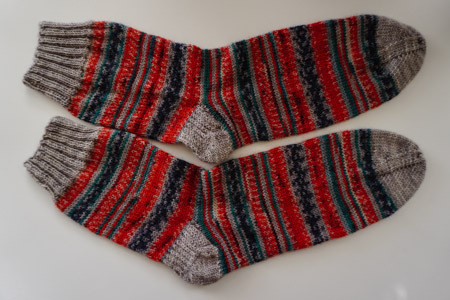 The instructions were perfect, and the heel was really fun to knit, too, though it strikes me as a little bit more shallow than I’m used to. These are going to my grandma, and I’ll see what she thinks (though she typically says everything fits “perfectly,” regardless of the true fit). Yarn: Regia sock yarn, color 03760, designed by Arne & Carlos (got it on eBay ), plus some gray yarn (which I think is Miss Babs, but I’m not 100% sure – the label is long gone). Needles: US 1 dpns (Susan Bates, my favorite!). My gauge with this yarn and needles is about 34 stitches/4″. I’m in the thick of knitting Christmas balls right now, and I think after that I’ll be tackling a few UFOs and a poncho for Sonya, but I can see more self-striping socks in my future a bit later on, for sure! Thanks for the review on the OMG heel. I have a really high arch, so the heel-flap-and-gusset heels are really the best fit for me, so I guess I will skip this one. Those socks are really handsome! I love working with Regia yarn–I like the feel of it, and the color combinations are great. I like to take the self-striping yarn and do an interesting pattern with it, such as feather and fan. Those Christmas balls look wonderful too, much nicer than other patterns I’ve seen for them.